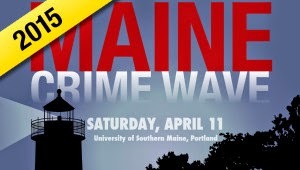 Last year's inaugural Maine Crime Wave proved a huge success. I'm happy to report that it's back for a second year, and this year's program is even more ambitious than last! The festivities kick off on Friday, April 10 at the Portland Public Library with Two Minutes in the Slammer. Attendees are invited to read a short passage of their own work (! ), and the best readings will earn an award from the crack team of judges. (This is a truly one-of-a-kind event, and I would have killed to participate when I was starting out.) Then, anyone who wants can grab dinner/drinks out with one of Maine Crime Wave's featured writers (including yours truly.) Anyone who'd like to participate in the reading or one of the dinners can RSVP here. Thomas Hood once said, “The easiest reading is damned hard writing,” and never is that truer than in crime fiction. Whether you’re penning a cozy mystery or a race-against-time thriller, it’s your job to dole out clues, stage reveals, and manage the pace such that an audience steeped in the genre’s conventions is kept guessing—and frantically turning pages—right up until the very end. This workshop aims to stock your toolbox with tips, tricks, and techniques to craft an exciting, unpredictable tale that hangs together well and keeps even the savviest crime fic fan reading into the wee hours. If you're interested in attending, click through for details and registration information. And if you're on the fence, perhaps you'll be swayed by Portland's unparalleled food scene, our wealth of tasty beer, or the offerings of our stellar craft distillers. Hope to see you there! "I love Chris Holm. He can evoke a landslide of character in a single detail. THE KILLING KIND crackles with muscle and moxie and wit. I will read it again and again." "Chris Holm’s latest is exceptional in every way, with breakneck pacing, sensational storytelling, and razor-sharp prose. At its hardboiled core is an unforgettable antihero who inhabits a violent purgatory of his own making, but discovers there’s a piece of his soul he hasn’t lost yet. Dark, riveting, and instantly addictive, THE KILLING KIND is this year’s must-read thriller." "With a great writer, a great premise, and a great protagonist, how can you lose? With his unique take on the hitman thriller, Chris Holm claims his place amongst the best suspense novelists working today. It takes real talent to make a hero of a cold-blooded killer, and Chris Holm pulls it off with style." I can't tell you how psyched I am that Stuart, Hilary, and Chelsea enjoyed it. They're three of the finest thriller writers on the planet. Many, many thanks to each of them. First word on THE KILLING KIND is in! One of the most exciting and nerve-wracking stages in launching any book is seeking out blurbs. For me, this has never been more true than for THE KILLING KIND. I took a big swing when I wrote this book — aiming to make it the sort of smart, propulsive thriller I love to read — and I hoped like hell it'd connect. We're still a ways from its September release date (heck, we don't even have proper ARCs yet), but my editor was kind enough to make a small batch of bound manuscripts to send out. All I had to do was reach out to some of my literary heroes — luminaries of the modern thriller all — and ask them if they'd be willing to take a peek. To my great delight, most said yes. And this weekend, the first few blurbs came in. So what's the verdict? "Lean, brutal and riveting, Chris Holm’s THE KILLING KIND is the kind of novel you can’t put down but also want to savor. With sharply etched characters, knifelike twists and hardboiled energy to burn, it’s an utter winner, beginning to end." "Chris Holm loads an ingenious premise — an assassin who kills only other assassins — into a high-powered story that goes off like a rocket. His protagonist, Mike Hendricks, is an all-American anti-hero with his own code of justice, living on stolen time. THE KILLING KIND is sleek and smart, and will stay with you long after you've finished reading." "A high-octane, cat-and-mouse thrill ride, written with style and a flair for the spectacular. Chris Holm is a master storyteller, and THE KILLING KIND is his best work to date. Don’t miss it." To say I'm honored would be an understatement. Many thanks to Megan, Joe, and Owen for their kindness and generosity. The fact that I'm a huge fan of theirs makes these blurbs all the sweeter. And stay tuned... fingers crossed this is only the beginning. Other Portland, Here We Come! 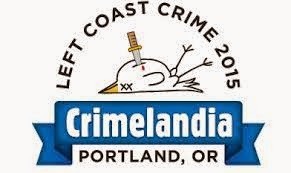 Left Coast Crime is soon upon us! I, for one, can't wait. I'll admit, a goodly part of that is thanks to the brutal winter we New Englanders are suffering through, but hanging out in a cool city full of book-folk still rates. You can see the full panel schedule here. And as ever, if you see me at the con and want to say hello, please feel free.